Quinn has been our “Miss Personality” since the day she was born. A Vizsla who is engaging, playful and funny at home, Quinn is also an outstanding hunting companion who covers the terrain with style and speed. She handles easily with just a whistle toot or a change in direction from her handle, and she has a way of the covering ground that is both fast and efficient. As she ages, Quinn reminds us more and more of her mother Sassy and especially her Grandmother, Nikki. The beat goes on. 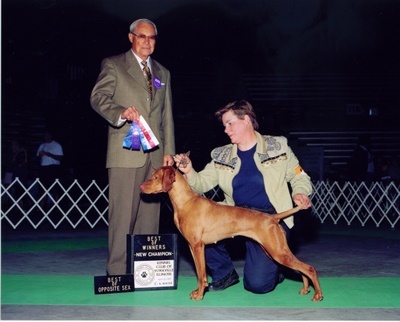 Quinn easily finished her show championship with 3 majors and is now happily retired from the show ring. She is listed in the <?xml:namespace prefix = st1 ns = "urn:schemas-microsoft-com:office:smarttags" />CHIC (Canine Health Information) data base with the certifications listed above.